That day was out of ordinary. First, it snowed in October. Is that how you guys do it in Estonia? I’m a foreigner here and came to study for my Master’s. Besides my studies, I happened to fall in love with Estonian startup innovation hype. After an awesome year working on the startup project at IdeaLab and a year in Germany as an Erasmus student I am again at IdeaLab but now as an alumni. It feels proud to help IdeaLab with marketing and communication. Back to that snowy October day (still can’t get over it, guys!) I went to the Idealab “Grow, pivot or fail” event to document the best moments. Just about 5 minutes later Maret invites me on the stage to share my experiences as one of the mentors. (!!) Who would have imagined that? But when there's an opportunity one has to grab it! 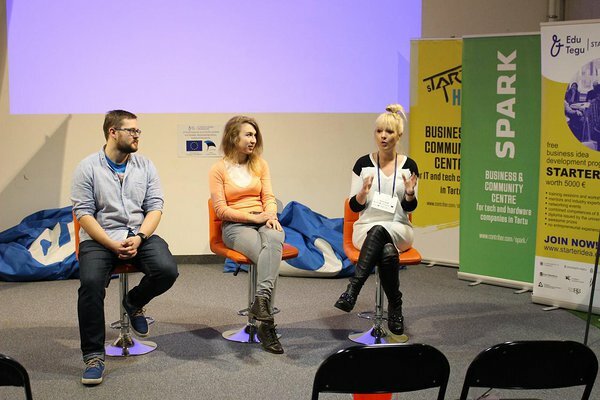 All of the sudden I was sitting on the stage with two other cool mentors Helen and Tanel, sharing our experience about product development process, team building, attitude to failure and of course, pivoting stories. I bet no one left the room scared of not trying or scared to sit down with their teammates over and over again to talk honestly about the “what”, “why” and “how”. Helen Kokk told a story of how years ago she was just starting as a designer and got her first assignment that she was responsible for. She designed an advertisement that was printed out on 10 000 papers. After it was all printed out, it turned out that there was a big mistake on the design! What is the learning point here? Helen was so sure that she can do it alone that she didn't ask for advice or feedback from anyone. Well, it turns out that you can't do everything alone! Helen's main point:"Don't be afraid to ask for advice and trust other people opinions!". Tanel Tähepõld gave advice about pivoting and failing. For example - build companies, not products and remember that pivoting is not failing. Tanel stressed:"Always be yourself unless you can be Batman. Then always be Batman!" And a tip for our STARTER teams - When you are chasing for money and all your energy and focus is only on finding the first investment then don't forget to develop your product meanwhile! And what did I talk about? One of the biggest learning points from my STARTER Basic times was that you need to know why are you and all your teammates doing it! What are your goal and purpose and make sure you know what you want to achieve before you start. After coffee and food, we all got back to the room for mentor hours, where we talked one-on-one with teams. Mainly we were discussing their distribution channels and getting to know their customers. I was so happy to meet those guys and discuss their ideas. When you are at SPARK Hub again, have a look at that pink beautiful room. It was where I got to sit down with some of the teams. My advice to all mentors: if you are not energized, have a meeting there – you start smiling automatically! Jokes aside, I would love the teams I’ve spoken with, to write in the Facebook comments or to my e-mail maryna.pashchynska@gmail.com what from our conversation was helpful and how else we could be helpful. In fact, let’s please have a comment or PM from each team on what was helpful and what you would want to be different. We all are there for you guys to skyrocket and it is only possible if we know what is on your mind. Life is like a box of chocolates - you never know what you are going to get! Show up and say yes to things that interest you! Thanks for the pleasure to meet you all, lots of love, until next time!